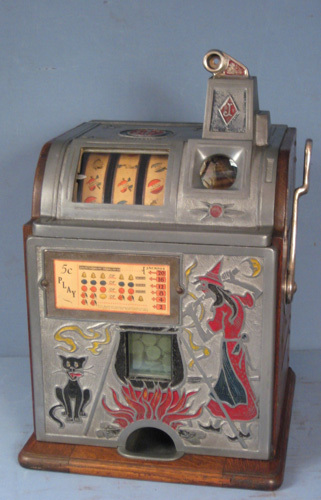 I am looking for a pre-1950 mechanical 50 cent slot machine (Mills, Watling etc.) My wife mentioned we "need" to get one so here I am!!! My first preference is the rare Watling 50 cent Rol-a-top followed by a Mills High Top. I am not against one of the electro-mechanicals from the 60-70's but the earlier slots are my main focus (pictures of what you have with price asked is welcomed). For shipping purposes I am in SE North Carolina and Thanks in advance. Hi Ken, I have a Mills 50 cent High Top Slot Machine. 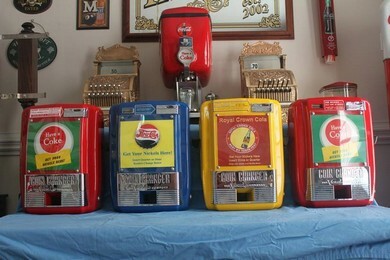 If you are interest I can send you pictures of a Mills Hight Top and Mills 50 cent Bursting Cherry slot machine. Please send any pics you have and the price you are asking. Where are you located? I am in Southeastern North Carolina (FT Bragg).